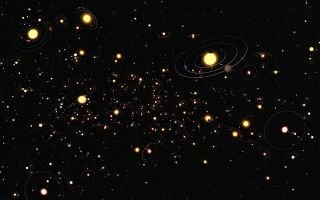 In this space wallpaper, an international team, including three astronomers from the European Southern Observatory (ESO), has used the technique of gravitational microlensing to measure how common planets are in the Milky Way. After a six-year search that surveyed millions of stars, the team concludes that planets around stars are the rule rather than the exception. The results will appear in the journal Nature on 12 January 2012.